immeria: WASP Market Research: what are the top resellers using? WASP Market Research: what are the top resellers using? Update: this post has been updated on 2008-09-22 based on new information about eBay. For some time now, the good folks at GrokDotCom, the Futurenow blog, have been publishing monthly stats and their opinion about the Top 10 Retailers by Conversion rate. Let's use WASP Market Research feature to check what are the top performers using when it comes to web analytics. 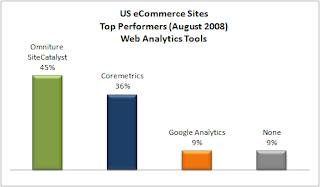 In the US, Coremetrics and Omniture SiteCatalyst are pretty much head to head. However, while SiteCatalyst is often more widely used then Coremetrics in other verticals, the fact they are so strong in retail might be a good indication of features specifically well geared for this market. Based on my personal experience with both products and independent evaluations, Coremetrics is often cited as "being strong in retail". eBay has been using Omniture for a while - you have to be in the measured sample to see that they are. It is roughly 1 in 100 that are sampled into the analytics grouping. At first glance, I'm surprised by this ranking. 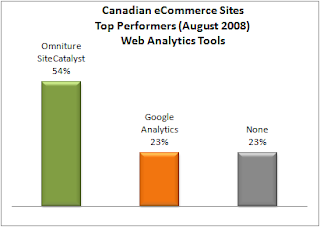 While some of those entries are clearly Canadian, what is Shopzilla.com doing in there? To my knowledge, it is not even a retailer site per say, but a comparison engine. Sales are not conducted there since users are redirected to Shopzilla partners. Furthermore, Shopzilla isn't even a site specifically doing business in Canada! The other surprising things are the absence of Coremetrics and the number of sites using both SiteCatalyst and Google Analytics. While it seems Amazon might not be using any of the popular web analytics tools, the fact of the matter is that they are using proprietary solutions (unless someone can confirm otherwise). Looking at ten sites in two regions is interesting, revealing some some interesting information. If I was responsible for a retail site this would give me some good cues. However, for more in depth analysis, vendors and market analysts can use WASP to analyze tens of thousands of sites at once.